Mor Kali / More Koozh is a tangy and spicy porridge cake made with butter milk and rice flour. 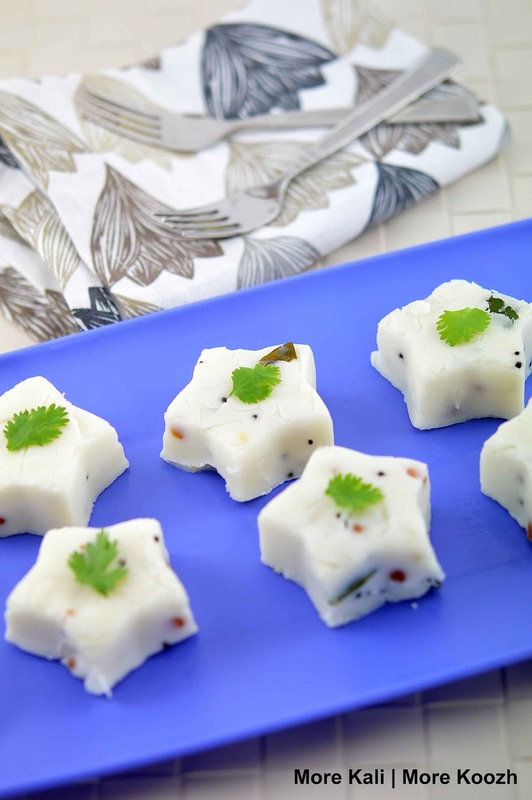 It's a traditional and authentic recipe made in Tamilnadu. 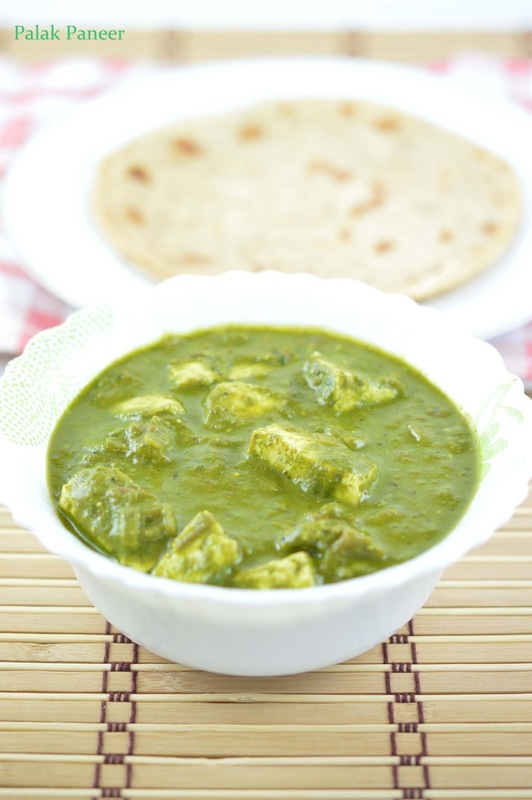 Mor kali is quick and easy recipe can be prepared for a light dinner. And also a perfect for light tiffin after school or work. It takes only 10 to 15 minutes to prepare. It can be prepared with left over sour buttemilk/ laban and its taste and smell is so awesome. My grandma make this mor kali whenever she have left over sour curd or butter milk. And she cut this into pieces and she gave as a snack to us when we came back after school. 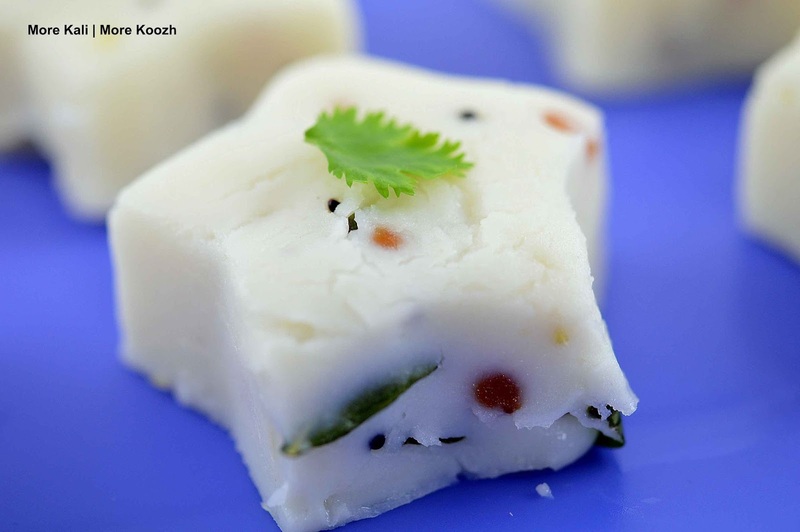 Those who loves butter milk and have a tangy tooth will love this Mor kali for sure. 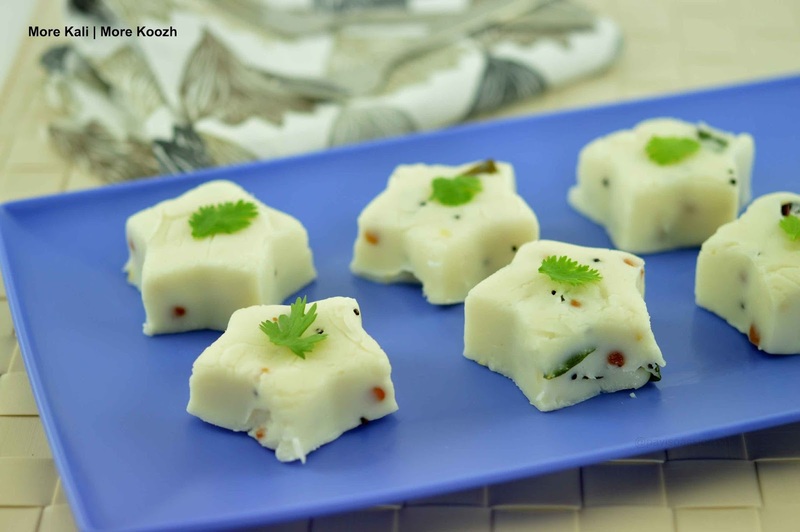 Try this easy traditional recipe and enjoy a great tiffin with your family. 1. Take a bowl, Add the 1 cup of rice flour to it. Then Add 1 1/2 cup of water and 1 1/2 cup of butter milk to it. Mix it with a whisk or laddle. 2. Mix thoroughly without any lumps. Add the required salt and mix well. 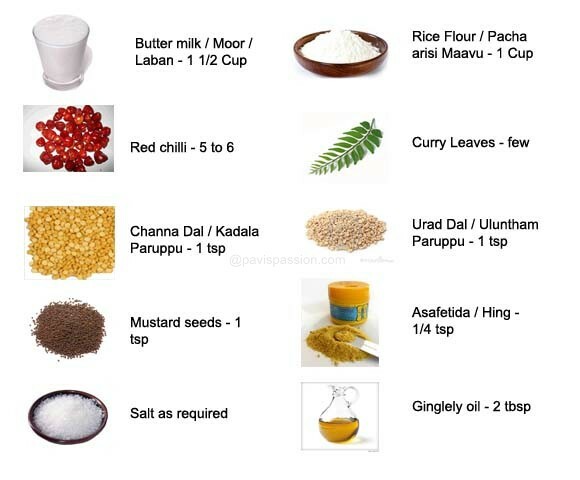 Heat a pan with 1 tbsp of oil Add the mustard seeds, urad dhal and channa dhal to it. When sputters add Curry leaves and fry it for a second. 3. Add Red chillies and Asafedita to it and mix well. Then add the butter milk and rice flour mixture to it and stir well. 4. Keep the flame to medium, Then stir the mixture slowly. Dont leave keep on stirring otherwise it forms lumps. 5. When the mixture and does not stick to the pan or starts to leaves the sides. switch of the stove. Then apply oil in plate. Then transfer the mixture to the greased plate. 6. 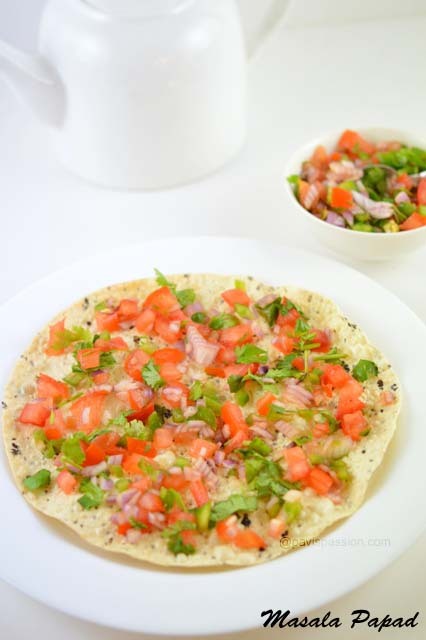 Make this mixture flat by using spatula or with the dosa laddle. Cut this into desired shape as you like. I used star cookie cutter to cut this into a star shape. Love this recipe! Share this to friends in Facebook, Twitter, Pinterest or in Google+. Leave your comments, Your comments are highly appreciated !